You know the great feeling when the cup in front of you lovely smells good quality, freshly roasted coffee from the best plantations of the world. Then it does not matter whether it is morning or evening, whether you're at work or at home, alone or with friends - really good cup of gourmet coffee plantation (single origin) or balanced delicate coffee mixture (blend) takes you into the world of being, peace, rest and pleasant relaxation. Enjoy a magical moment of peace with a cup of fragrant coffee on offer quality vino-obchod.sk. Barzzuz Brazil Santos NY 2 SCR. 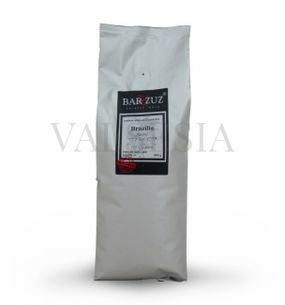 17/18, 100% arabica beans, 1000 g Brazilian Santos coffee Brazil is characterized by complexity and massive body. It subtly nutty and sweet with low acidity. Any coffee lover will appreciate its sweet and bitter chocolate flavors. Barzzuz Brazil Santos NY 2/3 SCR. 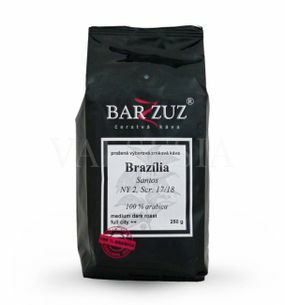 17/18, 100% arabica beans, 250 g Brazilian Santos coffee Brazil is characterized by complexity and massive body. It subtly nutty and sweet with low acidity. Any coffee lover will appreciate its sweet and bitter chocolate flavors. Barzzuz Ecuador Galapagos Gr. 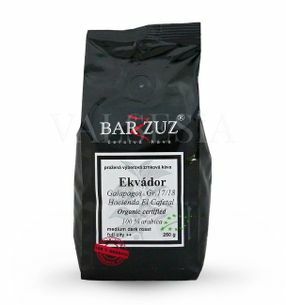 17/18, Hacienda El Cafetal, Organic certified, coffee beans, 100% Arabica 250 g Exotic coffee - is a very popular coffee lovers really quality coffees in which combines earthiness with finesse. The Galapagos coffee has a delicious sweet taste, very good body and acidity refined gentility. 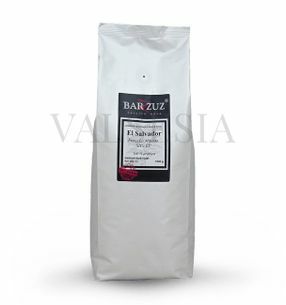 Barzzuz El Salvador Finca La Majada SHG EP, Coffee arabica 100%, 1 kg Delicacy in the form of Salvadoran coffee will charm you with very clean and balanced taste. The aroma is pleasant, the coffee has balanced body with a sharp but subtle acidity. Very delicate act of chocolate and hazelnut tones. 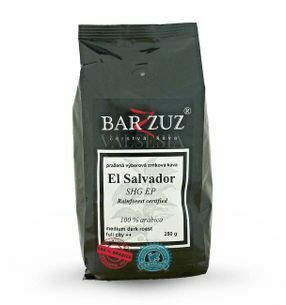 Barzzuz El Salvador SHG EP, Rainforest certified, 100% arabica beans, 250 g Pleasantly fragrant cup of quality coffee of El Salvador will win his clean and balanced taste with a pleasant aroma, well-balanced body, with sharp, yet deliciously delicate acidity, with hazel and chocolate tones. El Salvador SHG EP is similar to the Costa Rican and Guatemalan coffees, Antigua region. 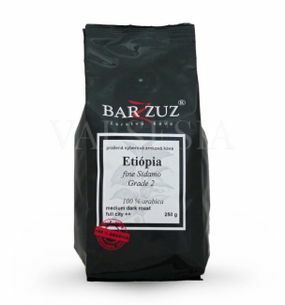 Barzzuz Ethiopia Sidamo Grade 2 fine coffee 100% Arabica 250 g Ethiopia is the original homeland of coffee. Ethiopian coffee is characterized by finesse and rarity of dark fruit flavors with a hint of korenistosti. Ethiopian coffee is typically the lowest caffeine content. Barzzuz Ethiopia Kefa, Gr. 3, Natural, coffee 100% Arabica 250 g Unwashed Ethiopian coffee Keff is a very popular choice because it is really great. 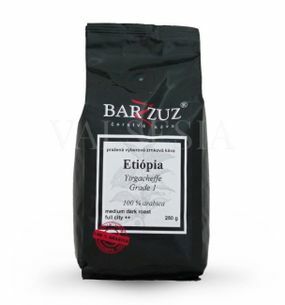 The taste of the Ethiopian coffee fresh with delicate notes of chocolate, with hints of wild berries. To feel wild, no smoothing. It's coffee, which recommends a try. 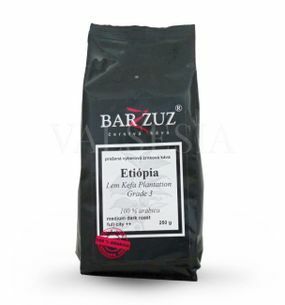 Barzzuz Ethiopia Yirgacheffe Grade 1 coffee, 100% arabica 250 g Coffee from coffee's original homeland of Ethiopia Yirgacheffe coffee is fine and rare, the taste is light fragrant floral tones, slightly spicy and is among the finest Ethiopian coffee. 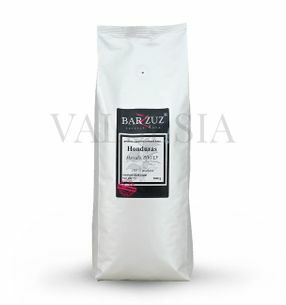 Barzzuz Marcala Honduras SHG EP, Coffee arabica 100%, 1 kg Coffee from Honduras is pleasantly velvety. It is a coffee that is very well balanced, with a light body, subtle acidity, fruity flavor and sweetness in the aftertaste. 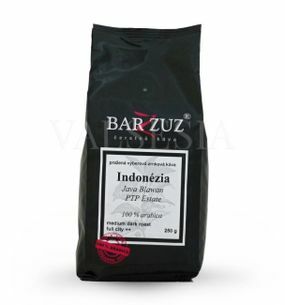 Barzzuz Indonesia Blawan PTP Java Estate Coffee 100% arabica, 250 g Coffee from Java is among the most famous in the world. 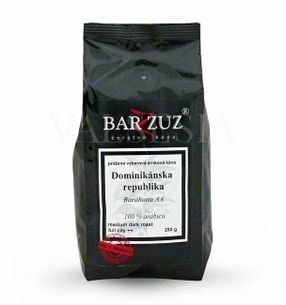 It is a coffee with a strong body and a very low acidity. The flavor is earthy discover, tobacco and fruit tones. It is a delicious coffee that will delight at any time of the day. Barzzuz Indonesia Blawan PTP Java Estate Coffee 100% arabica, 1000 g Coffee from Java is among the most famous in the world. It is a coffee with a strong body and a very low acidity. The flavor is earthy discover, tobacco and fruit tones. It is a delicious coffee that will delight at any time of the day. 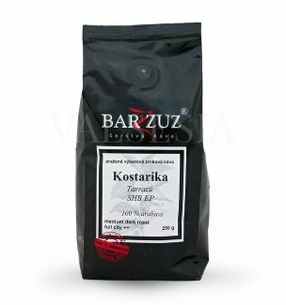 Barzzuz Kopi Luwak Indonesia A / WP 1 Kayumas Estate, civet coffee beans, 100% Arabica, 125 g If you fancy a coffee exotic tested - Kopi Luwak is the best choice. Kopi (coffee) and Luwak (small animal that did eat ripe cherry coffee). Fermentation and processing of coffee takes place in the digestive tract of the civet. Coffee has a unique flavor and aroma. 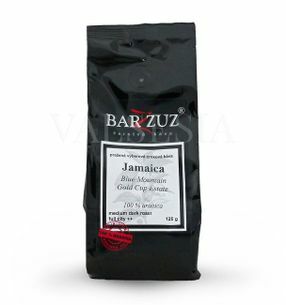 Barzzuz Jamaica Blue Mountain Gold Cup Estate coffee 100% Arabica 125 g The icon of the coffee world - Jamaica Blue Mountain is known to every lover of quality coffees. It is exceptional richness and fullness while noble finesse. Harmony of acidity and sweetness with aromatic sensations creates a sense of complexity and zamatovosti. 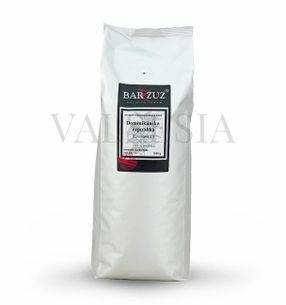 Barzzuz Colombia Supremo 17/18 Medellin, coffee beans, 100% Arabica 250 g Colombia Supremo is among the most popular coffee from Colombia mainly for its sleek, yet rich and full flavor. 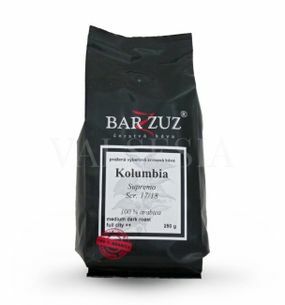 The Colombian is delicious for its balanced flavor with hints of chocolate and alluring aromas. 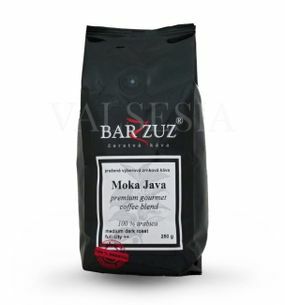 Barzzuz Moka Java, premium gourmet coffee blend, coffee beans, 100% Arabica 250 g Blendová great coffee with a wonderfully full-bodied, earthy tones acting appropriately and minimal acidity. It operates a taste extremely comprehensive and holistic and excel in it the advantages of each component. 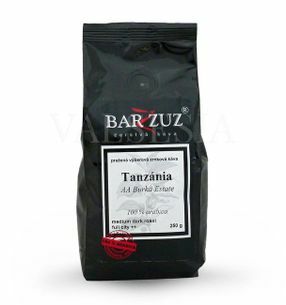 Barzzuz Tanzania AA, Burka Estate, coffee beans, 100% Arabica 250 g Coffee Kilimadžára the field is very specific and is designed for gourmet coffee lovers. It is characterized by sharp acidity with a wine-tasting berries, can be found in it as well as floral notes. 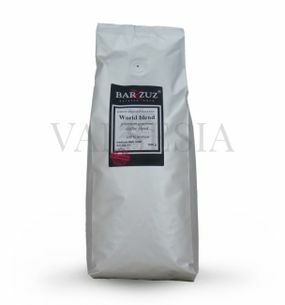 Barzzuz World blend, blend premium gourmet coffee, coffee beans, 100% Arabica 1 kg Carefully selected mixture of mountain coffees from around the world. Blendová coffee, which is a combination of great coffees made the coffee ,, experience "with a long aftertaste of chocolate, the best you will enjoy it with a cup of espresso. It's really a global coffee.